Well, a few of the regular cruisers are straggling back…and heard through the grapevine that Mazatlan has a great Halloween tradition. So a few of us went downtown to Plaza Machado to check it out. 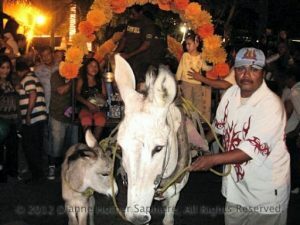 Instead of the traditional visit to the cemetery for All Saints Day, Mazatlan has more of a community costume party and parade…featuring the Catarin and Catarina characters…and four festive burro-drawn wagons with huge kegs that pass out free beer until it’s gone. So I joined Margy and Colin and their friends from Victoria, along with Rick from Magic Places, for a ringside seat and dinner at one of the restaurants – then a stroll around to meet the donkeys who were working so hard.